(U//FOUO) There is continued terrorist interest in attacking the rail system either as the primary target or as an attack mechanism. The US railroad system includes 800 railroads, 144,000 miles of track, and 212,000 railroad crossings. 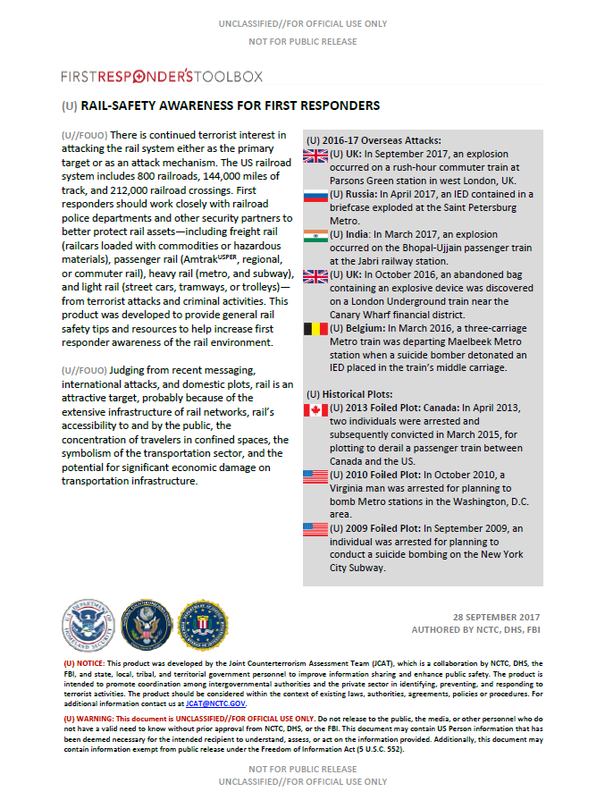 First responders should work closely with railroad police departments and other security partners to better protect rail assets—including freight rail (railcars loaded with commodities or hazardous materials), passenger rail (Amtrak, regional, or commuter rail), heavy rail (metro, and subway), and light rail (street cars, tramways, or trolleys)—from terrorist attacks and criminal activities. This product was developed to provide general rail safety tips and resources to help increase first responder awareness of the rail environment. (U//FOUO) Judging from recent messaging, international attacks, and domestic plots, rail is an attractive target, probably because of the extensive infrastructure of rail networks, rail’s accessibility to and by the public, the concentration of travelers in confined spaces, the symbolism of the transportation sector, and the potential for significant economic damage on transportation infrastructure. (U) The 17th issue of AQAP’s English-language Inspire magazine released in August 2017 featured train-derailment operations. Inspire specifically provided detailed instructions on how to construct a homemade derailment device. (U) INDICATORS OF TERRORIST/CRIMINAL ACTIVITY: A totality of behavioral indicators and other relevant circumstances should be evaluated when considering law enforcement notification and response. If determined that conduct or behavior is, in fact, suspicious, law enforcement professionals should further examine the circumstances. No single indicator should be the sole basis for law enforcement action. • (U//FOUO) Individuals trespassing on railroad property such as railroad tracks or rail yards. • (U//FOUO) Individuals displaying unofficial or suspicious uniforms or credentials on or around railroad property. • (U//FOUO) Suspicious items or unusual debris left or placed upon the tracks. • (U//FOUO) Vehicles parked along railroad or transit right of ways, rail yards, or rail facilities. • (U//FOUO) Theft or damage to railroad tracks, equipment, vehicles, buildings, signal structures, trains, or locomotives. • (U//FOUO) Discreet use of cameras or video recorders, sketching, or note-taking consistent with preoperational surveillance of railroad tracks, crossings, rail switches, facilities, cargo, locomotives, or railcars. • (U//FOUO) Unusual observation of, or questions about, the arrival and departure times of trains, peak travel times, and/or the size and capacity of passenger cars. • (U//FOUO) Unusual interest in, or questions about, rail-transit operations (transit maps) or rail equipment (missing or stolen track maintenance tools/keys) that can be potentially used for destabilizing a track. • (U//FOUO) Missing or stolen track-maintenance tools that could be used to destabilize track. • (U//FOUO) A succession of clips or spikes missing from track sections. • (U//FOUO) Attempts to disable, tamper, or destroy transit equipment, including removal of rail spikes or clips within an area, or movement of rails out of alignment. • (U//FOUO) Railroad materials such as ties or heavy equipment, or debris such as concrete blocks, tree limbs, or trunks placed on tracks. • (U//FOUO) Unauthorized digging, removing, or undermining track bed materials/ballast. • (U//FOUO) Unexplained possession of protective gear for working around high-voltage lines (including insulated rubber gloves, tools with rubber handles, grounding bars, and hard hats) by unauthorized personnel. • (U//FOUO) Unusual observation of or prolonged interest in, or attempts to gain sensitive information about, security measures of personnel, entry points, peak days and hours of operation, and access controls, such as alarms or locks, or multiple false alarms or fictitious emergency calls to rail areas.